Most of the Firefox browser-maker's US$562M in revenue came from deals struck for the default search engine spot. Mozilla's revenue in 2017 increased by 8% over the year prior but expenses shot up more than twice that, by 17%, during the same period. 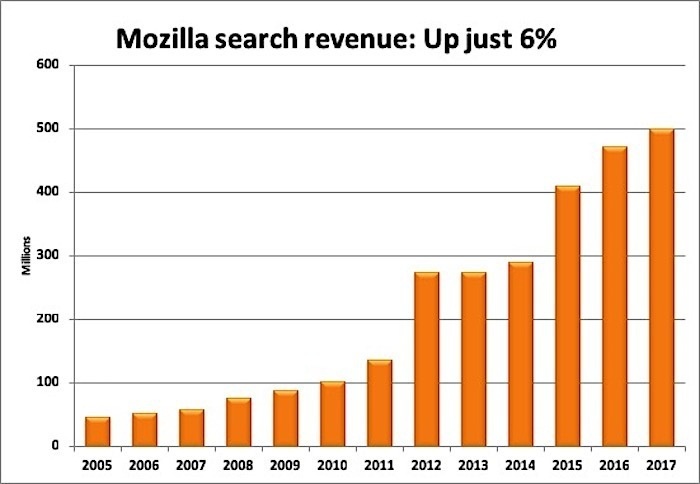 Most of the US$562 million in revenue for the Mozilla Foundation came from royalty payments, with the bulk of that generated from various deals struck for the default search engine spot in Firefox. Mozilla Foundation is the nonprofit that in turn runs Mozilla Corp., the commercial organization that creates and services the Firefox browser for Windows, macOS, Linux, iOS and Android. According to Mozilla's 2017 financial statement released on Tuesday, $539 million, or about 96% of all revenue, came from royalty payments. The percentage of revenue derived from royalties has never been under 91% - Mozilla's fortunes have always been tied to Firefox's search contracts - but 2017's portion was slightly lower than 2016's. The modest boost in search contract revenue was notable because it showed that Mozilla's latest switch of providers did not materially increase revenue. A year ago, Mozilla dropped Yahoo as the Firefox default for the U.S., Canada and a few other countries. The company then re-upped with Google, which had been its go-to search provider, and largest source of revenue, for years until the organization went with Yahoo in 2014. Last year was the first full year of the newest contact with Google. Neither Mozilla or Google disclosed the financial terms of the deal struck in 2016, but by 2017's revenue report the money wasn't much more than a replacement for booting Yahoo. There was no hint in Mozilla's 2017 financials that the organization continued to receive payments from Yahoo after it switched to Google. That wasn't a surprise: The two sued each other in California Superior Court late last year over the contract. The Yahoo-Mozilla deal had an unusual clause that gave Mozilla the right to skip out if Yahoo was sold. Under the agreement, Mozilla was to be paid for the full length of the contract - even if it was the one thT ended the agreement before the 2019 expiration - or alternately the difference between Yahoo's annual $375 million and whatever Mozilla got from a new partner. Verizon purchased Yahoo for $4.5 billion in mid-2017, then lumped it with America Online to create a new company, Oath. While Mozilla revenue scratched out an 8% increase, expenses climbed at 17%, more than twice that rate. Most of Mozilla's expenses - 60%, down three percentage points from the year before - were for software development, which climbed to $253 million, a 12% increase and double 2016's boost. The sharpest increase on the expense side, however, was the 39% gain on the "branding and marketing" line item, which went from $47 million (2016) to $66 million (2017). Not surprisingly, the difference between revenue and expenses shrunk slightly in 2017 as the latter rose faster than the former. Mozilla's "profit" - the "net cash provided by operating activities" line on its financial statement - slipped from $108 million the year before to $101 million in 2017, a downturn of 6%. Even so, Mozilla appeared on solid financial ground. Its rainy-day fund - the total in cash, cash equivalents and investments - rose to $464 million, up $65 million from 2016, for a 16% year-over-year increase. That savings could power Mozilla at its 2017 expense pace for slightly more than 13 months, even if all revenue evaporated. For all the inclusiveness implied by the title of the long blog post that accompanied the financial statement release - "State of Mozilla 2017" - the organization omitted crucial information, notably how Firefox stacked up against rivals. Firefox's share of the desktop browser market, the only space in which it is competitive, has plummeted this year. Although Firefox's user share, an estimate generated by analytics vendor Net Applications, dropped by just 1.2 percentage points in 2017, ending the year at 11%, in 2018 it's taken a dive. Since January, Firefox has lost 1.8 percentage points, closing out October at 9.3%. Unless Mozilla arrests the downward trend, Firefox could account for little more than 5% of all browsers worldwide by this time next year. Share is important to all browsers because the applications are revenue generators for their makers in one way or another. Mozilla's interest is particularly sharp because other major browser developers - Google, Microsoft and Apple - have numerous revenue streams. Firefox, though, relies on search contracts almost exclusively, and those deals depend on the browser being able to bring users to a search site. Minus significant numbers of users, providers will have little reason to pay Mozilla for the default in Firefox. Mozilla's search contract revenue climbed to $501 million in 2017, an increase of 6%. Gains of the two years prior had been 7x and 2x that of last year's.